Nemenon had sent his assassins and destroyed Maelis Keshnar's village, and her grandmother was murdered before her eyes. Escaping the terror she had witnessed, Maelis traveled far, but did not realize she was being watched, and tracked. One of the assassins, Joran Tohknar, had chosen not to kill her, and now he watched as she slowly recognized the powers she possessed. Maelis was the last in the line of the green-eyed witches. The prophecies said that she would be able to destroy Nemenon. Only with the help of Joran, her assassin turned protector, will Maelis be able to recover the stones, channel the Elements, and liberate the people of Nuermar. 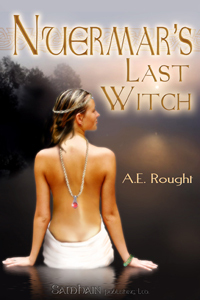 Nuermar's Last Witch is reminiscent of a great epic fantasy. But what makes this story more enjoyable for me, is that at heart, it is a romance. Although filled with strife, and suffering, particularly when describing the tortures Joran endured when forced into Nemenon's service, the story was touching as Joran struggled to become the man he should have always been. A protector. I am interested in seeing where A.E. Rought plans to take this series next.